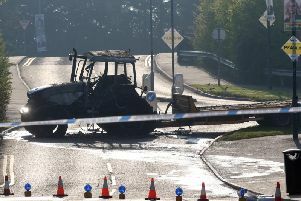 Police say a car recovered during an overnight security alert in Dunmurry may be connected to recent criminal activity in the area. The Azalea Gardens alert ended on Saturday afternoon after a number of controlled explosions were carried out on a suspect vehicle. A number of items have been recovered and taken away for further examination. Detective Inspector Stephen Harvey said: “We suspect that this car - a black Ford Mondeo – may be connected to a robbery at office premises in The Cutts area on Monday, April 3 when three men, dressed as postmen and one armed with a suspected firearm, entered the offices, assaulted two female members of staff and made off with a sum of money. The detective thanked all those inconvenienced during the operation for their patience. “I would appeal to anyone who has information about the robbery at The Cutts or who saw any suspicious activity in the Azalea Gardens area to contact police on the non-emergency number 101, quoting reference 1178 of 7/4/17.